Electronic chart navigation means using a software program on a computer or other device that is designed to display electronic charts with built in electronic charting tools and a connected GPS receiver that shows your vessel moving across the chart. There are dozens of such programs available offering various levels of sophistication to assist the navigator in both route planning and navigation underway. Once mastered, these electronic charting systems (ECS) provide the state of the art in navigation safety and efficiency for all vessels, power or sail, commercial or recreational. But as with all new technology, there is much to be learned before we can take full advantage of all the resources the programs offer. We start with the manuals, and oftentimes detailed videos on the functioning of the programs, to learn the basic operations, such as how to load and view charts, and set up optional displays. And we learn the tools they offer such as setting waypoints and making routes, measuring range and bearing, using range rings, and more. We learn that most of the ECS programs will also accept AIS signals telling us the location and motion of nearby traffic, and we learn the ECS offers various alarms and alerts we can set for safe navigation underway. Much of the basic use we can learn from the static situation of just having our vessel at a fixed location on the chart, and then we have to head out onto the water to see how these resources operate when underway. The Starpath eNav Trainer offers a way to master the use of ECS underway from the safety of your armchair, desk or classroom. The key is a realistic simulation of the GPS signals you would receive if you were indeed underway and moving. Sitting at your computer, your program thinks you are actually on the water. In another window on your computer or from the screen of your phone or tablet, you have the vessel controls that drive the boat your ECS is monitoring. Just as when on the water in your own boat, you turn right on the controls, and you see your boat turn right on the echart display. Speed up, slow down, drive however you choose. If you run into a charted buoy, you won't get hurt, but you will have something to think about! With this simulation resource, you can practice with the navigation tools of your program, many of which are vessel centered, and you can practice setting various alarms, and see them work in action. You can make routes and practice following them. For example, often there is an option to set a range ring on a way point and let the program automatically change to the next waypoint along the route when you cross that range. The eNav simulation is a way to see such operations in action under various conditions. To add more realism to the challenge—and demonstrate the value of practice—the eNav Trainer also adds current flow to the waterway. With current present, you vessel will not make good the course you are steering, so you can practice following a route in these conditions. The eNav simulates a heading sensor, so your echart program knows which way you are headed, as well as the COG you are making good at any time. Learning to read and interpret these two crucial outputs is another thing you can master with this tool. You can even practice docking in current. The eNav Trainer also offers crucial practice with collision avoidance using either real or simulated AIS traffic. If you have access to live AIS signals—there are numerous Internet connections that provide these—then you could drop your own vessel into, for example, a very busy San Francisco Bay, Puget Sound, or Chesapeake Bay, and practice simply driving from one side to the other without violating the Navigation Rules. Or choose the Port of Shanghai or Singapore for even more difficult traffic challenges. But is it likely best to start out slower with eNav's simulated AIS traffic. When you choose to run several vessels in a simulation, each will appear as an AIS target to the others. Practicing on your own, you can open two control panels, choose one for your own vessel and the other for the AIS target. This way you can present the approaching AIS target as you choose, and then study collision avoidance with it, testing the CPA (closest point of approach) alerts your program offers. With two or more navigators practicing together, each can control their own vessel, and monitor it in their own ECS program. They can be the same brand of ECS or different. Then each will see in their program their own vessel as well as the other, which will appear as a moving AIS target. Both then practice collision avoidance together. When practicing from remote locations, the two (or more) navigators can communicate via the eNav's simulated VHF radio, which offers crystal clear audio connections between users. In short, there are unlimited training exercises users can work through to master the navigation tools of their chosen ECS, just as they will appear when underway. This can lead to expertise and confidence in the use of electronic navigation that is hard to come by without many miles of actual experience—not to mention that you can practice all the scenarios you do not ever want to encounter underway. The Starpath eNav Trainer is a realistic GPS, AIS, and heading-sensor simulator designed for individuals or groups so they can master the full use of their chosen electronic charting systems (ECS) and to practice realistic navigation maneuvers with other moving vessels, either simulated or real, viewed as AIS targets on their screens. This Internet based simulation can be used with any brand of ECS, using raster or vector echarts, for any part of the world. Simultaneous users, driving individually simulated vessels, in a mutually chosen waterway, can be located in the same classroom, or they can be located in different parts of the world. They just set their ECS chart displays to that waterway and see each other on the chart. Modern electronic charting systems are sophisticated software with many powerful options for enhancing safe navigation. Many of these tools, however, are difficult to learn and practice without being underway. With eNav Trainer you can practice navigation and collision avoidance in current and in traffic, learn how various automated safety and convenience features and alarms of your program actually work, practice various display options, and so on. With real-size vessel icons, you can even practice docking or coming along side another moving vessel. When simulating multiple vessels, you can jump the control from one vessel to another to see how each perceives the other in various maneuvers. Details of how the eNav Trainer is setup in your computer are given at eNav Trainer Help. 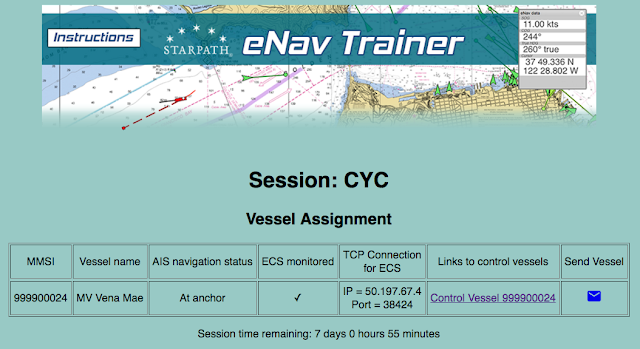 In anticipation of our new Starpath eNav Trainer (an integrated, multi-vessel GPS, AIS, VHF, and heading sensor simulator), we have here a few notes on how to make a network connection to your navigation software. The process is very similar for all software, with differences only on how you access the needed input screens. Then each program has separate ways to verify the connections. The use of network connections in navigation software is increasing, because more instruments offer this option to interface onboard sensors as well as make external Internet connections for various aspects of actual navigation. In this case, we are using this connection to provide a powerful training tool that will help mariners learn and master the special features of their navigation software of choice, and then go on to provide practice with realtime interactions with other simulated vessels viewed as AIS targets. With it you can also learn more about AIS protocol as well as study collision avoidance with AIS targets. The AIS targets studied can be either those provided by eNav or live AIS signals received by another connection. To make this connection, you will need to know the IP (Internet Protocol) address of the eNav server, along with the port number used on that IP. An IP address is the same as a URL for a webpage. In some programs you can input the URL text or the IP numbers; some accept only the numerical IP address. The IP and port numbers used by eNav are dynamic numbers that will change for various users, but once you have your session set up in your navigation program they will remain unchanged. You can close the program or switch to live GPS (via a serial or USB connection), and then later return to simulation practice. Navigation programs store connections once made, and they remain available until you choose to remove them. Within each program there is the option to enable or disable specific connections as needed. To switch to live GPS, the eNav connection should be disabled. The eNav user's Vessel Assignment page that provides the network connection data. We use TCP (Transmission Control Protocol) for the connection, which is sometimes written TCP/IP. To illustrate the network setup process, we give several examples below, first as a text outline, followed by a short video showing the actual steps in action. To have your navigation software recognize the connections outlined below, the eNav link must be active on the eNav server. If you have the emailed link showing the IP and Port (shown above), then that means the connection is active. If the connection is not active, or the input numbers were not correct, the connection will not be completed. Some programs alert you to this error, others do nothing. No possible damage can be done. When the connection is active and entered correctly, it will log on immediately and start receiving the signals. You can set up and confirm the initial connection to eNav without having your vessel positioned where you eventually want it (anywhere in the world) and without the appropriate chart(s) installed. After this initial connection, If you check your program’s GPS position report to see “where you are,” you will find that you are located in Puget Sound, Seattle, WA (47º 43.0’ N, 122º 25.0’ W), just north of Shilshole Bay Marina. That is the default starting location for all vessel simulations, which is on US RNC chart: 18446 or ENC US5WA14M (Puget Sound, Apple Cove Point to Keyport). This note covers just this one step of setting up the network connection. The process of setting up vessel location and other information is given here: Control Panel and vessel set up. Using the procedures described there, you can move your vessel to any location and make other specifications for the simulation and navigation training. To end a simulation session using any navigation program, first use the eNav vessel control panel to anchor your vessel, then you can just close the program, and when you return you can carry on without further set up. f you want to use another source of GPS for actual navigation, then go back to the network setup window and disable the eNav TCP connection and activate your new GPS source. Usually you do not have to remove it, just disable it. Then you can turn it back on when ready to practice more. Press OK, and close the window. You should see a yellow band on the top of screen with notification of a simulated GPS signal. This notice can be closed. To confirm the signals, close the Instrument Ports window, and open Troubleshooter. In the top line Port, select your vessel name. You will then see the sensors detected: GPS, Compass, AIS. You can close or view actual data if you choose. Then return to main program and zoom out on the chart to see where your vessel is located. See Control Panel and vessel set up for next steps, which include positioning it as you choose. To disable the connection and save the configuration, just uncheck the Listener box. 1. Start the program and be sure to select Navigation mode when booting. 2. The Connection Wizard should show up open, but if not select it from the main menu (top left). If not listed there, then reboot the program and be sure to start in Navigation mode. You should see the data stream in at this point, Press Next to confirm that you are receiving GPS, AIS, and Heading sensor data, and then Close. Zoom out on the chart to see where your vessel is located. See Control Panel and vessel set up for next steps, which include positioning it as you choose. 2. Back to main menu Instruments / Serial and network ports. To confirm the data, press Raw data. You should see the NMEA sentences streaming in. Then OK and OK.
Checks in Control checksum and Receive data on this port. No check in the Output on this port. You should see the top right GPS signal icon go green. 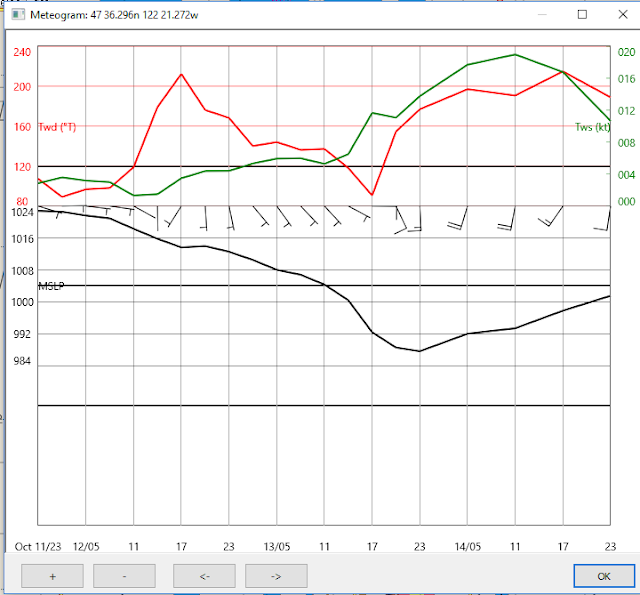 To confirm the data, in the same connections window, choose show NMEA Debug Window. It will likely open behind what you are looking at, so move that window to see the data, then you can close both of them. There is an Enable check box in the list of ports that can be used to disconnect and save the configuration for later use. 3. The Port Manager window will then show up with your network connection. Highlight it and then press Start. And close that window. You may not see any change at this point, but you can check the input from the main menu / Ship / NMEA Console, and then you will see the signals stream in. To see your vessel on the chart, from main menu, select Live Ship Mode, and then your vessel will appear on the chart. To disable the simulation, from the Port Manager, click stop. See Control Panel and vessel set up for next steps, which include positioning it as you choose. We have a nice Low approaching the Pacific Northwest so beyond its other implications, ie gusts to 50 kts forecasted for Puget Sound, and much rain, we can look to the brighter side, and take this opportunity to calibrate barometers. 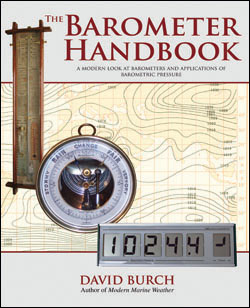 Just start a log and write down every few hours or so what your barometer reads... and do not move its location, meaning do not change its elevation above sea level. Then by end of week end you can look up the local pressure reported for your nearest location and compare the two. 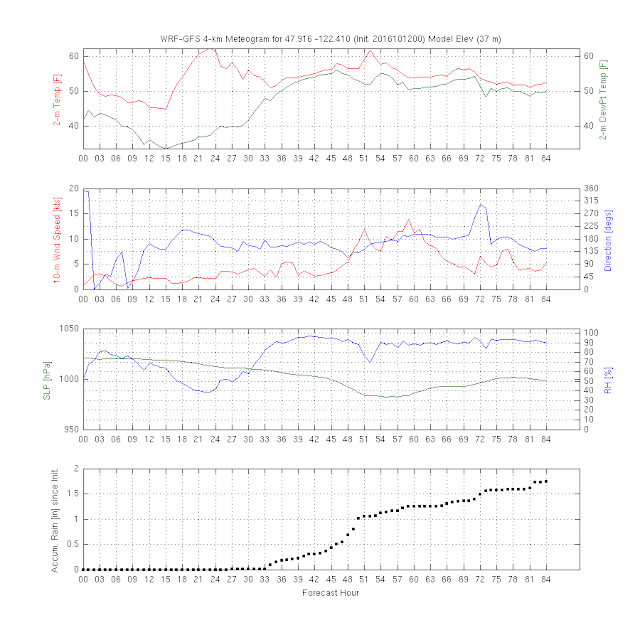 We expect a drop from about the present 1024 down to 993 tomorrow around 4 to 6 pm. 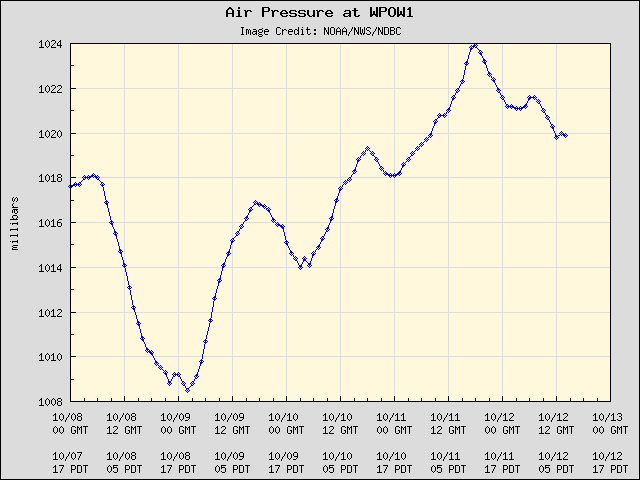 In Seattle area, check your pressures at WPOW1, the West Point Lighthouse, which presents a graph like below, but also tabulated data. You can also use custom pressure links we have set up at www.starpath.com/local. 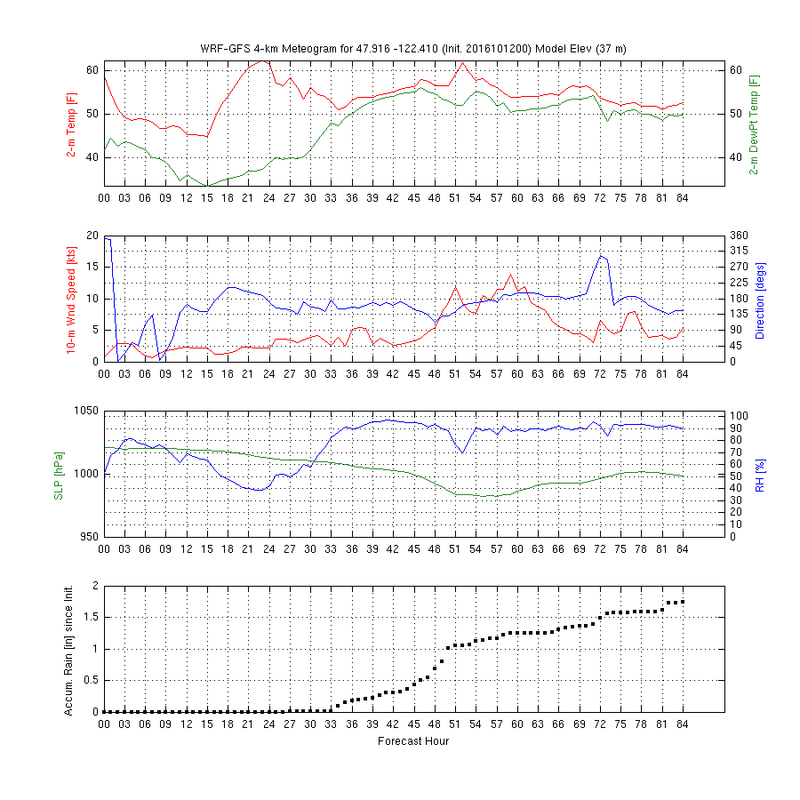 Or check "UW meteograms" from link at www.starpath.com/insidepassage for another prediction. Note their statement that these take a few minutes to build once requested. Here is the latest weather map, from 5 am this morning. If you get good data and want help analyzing it, then just send us a copy of it to helpdesk@starpath.com ie two columns, one of time and date, one of pressure from your barometer. Include your lat lon and the height of your barometer above the ground. We can find the ground height from here. Record pressures to the nearest tenth of a mb. Successful navigation depends on accurate resources, meaning in large part the hydrographic products such as nautical charts, coast pilots, light lists, tide and current tables that we find in every nav station, pilot house, and bridge around the world. There is an immense amount of data compiled in these charts and documents, much of which is subject to change, so it is obvious that any way mariners can help the agencies keep these up to date is a step forward that benefits all users. All hydrographic offices around the world offer some means of reporting discrepancies found in their products. There are online forms that can be used, or a call to the local ATONs office at the USCG is always appreciated. But these days, the first thing that comes to mind when we have a common problem to solve is: "There ought to be an app for that!" Well... as it turns out there is an app for that, and we can thank the United Kingdom's Hydrographic Office (UKHO) for it. In the Apple App store it is called H-Note. It is a free iOS app that very conveniently lets users prepare a report of any discrepancy in charts or publications direct to the UKHO. I have test tested this, and they got back to me the next day, with an acknowledgment. Furthermore, I have since spoken with them and indeed we can use this app to report discrepancies or additions for any chart or publication produced by an official national hydrographic office. They do this because they distribute charts from many nations for all waters of the world, so they have close ties with all related agencies worldwide. Naturally, we would not expect them to address discrepancies in third party charts or unofficial navigation pubs, which are beyond their control. Typical input screens are shown below. The key here is convenience and a consistent format. And indeed they are asking for all the key information they need to address the report. The Publication Affected input even has a drop down that lists all of the UKHO pubs, but you can overwrite these with the pub in question, if it is not on the list. The idea is beautifully simple. Using the app, mariners can report chart or nav pub corrections with a quick message from their phone. Underway you can actually tag the location with your device's GPS to precisely mark the location of your observation, though you may not be able to transmit it till you have an email connection. You can also take a picture of the real object you are commenting on as well as a picture of the charted object in your ECS and include those with the report. The app works by preparing a formatted email with your added images and then sending it to UKHO. Thus you do not actually need an Internet connection to file a report, but just an email connection. With something equivalent to Iridium Go, you would "Submit" the report from the app and then it would go out as an email to your high seas email program in your computer, and wait there till your next connection satellite connection. Then it would send automatically with your next incoming or outgoing mail batch. This assumes that while underway you have set your phone to use the mobile mail service as your outgoing mail server, which is common practice with this type of equipment. On inland or coastal waters, the message would just sit in your outbox till your next phone network connection underway. In short, the process of sending a report is so easy that one is much more likely to actually send it. Following up on a logbook entry after a long or tiring voyage is less likely. On a day sail, you can report that your favorite buoy is off station as you sail by it... pronounced "boy" in this case. Actually we have had in the US a very similar system for efficient reporting of hydrographic discrepancies for many years. 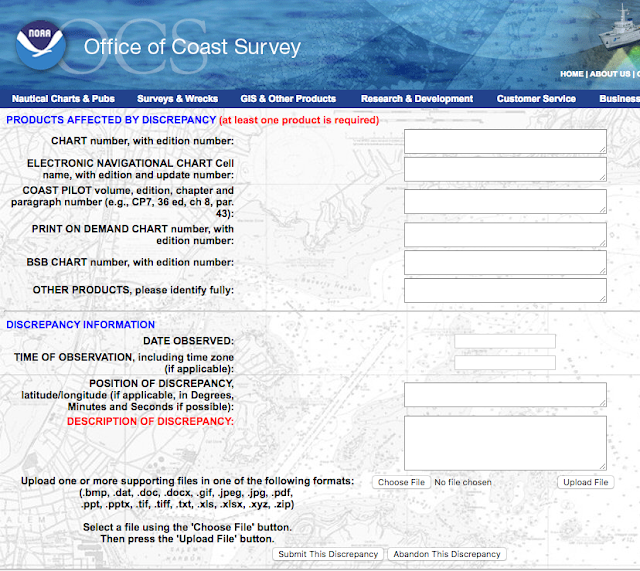 It is called NOAA's Nautical Discrepancy Report System. The form is then submitted over the Internet and serves the same purpose as the UKHO app. But since learning about the UKHO app, I can see the value in having this as an app. For one thing, with the app you do not have to be online at the time you file the report, and the app can read your GPS position automatically. Also drop down menus with as much filled in as possible ahead of time is always a help. It is hard to beat just pulling your phone out of your pocket and sending a report as you spot a need. Maybe NOAA will consider something like this, or maybe they already are. In the meantime, there is a way to get this onto your phone. You can email (or txt) the link to the NOAA Discrepancy Form (http://ocsdata.ncd.noaa.gov/idrs/discrepancy.aspx) to yourself, and then check mail or messages on your phone. Clicking the link in your phone will open that page in a browser in your phone, and at that point you can save that link to your phone's home screen. On an iPhone, you do this with the Send-to link at the bottom; then choose Add to Home Screen. Enter an email address (so you can get an answer back), and in two clicks you are ready to fill out the report and send it. I have tested this NOAA form by sending in an obscure minor correction and did indeed hear back the next morning with an acknowledgment and encouragement to send whatever we discover. And now, in a sense, to my main point, which I will only mention for now, as we are preparing more notes on this topic. We are working on new training materials for electronic chart navigation, which has led us to even more study of electronic navigation charts (ENC). For years we have appreciated the challenge to navigators of moving from traditional paper charts to electronic charts—especially to the use of ENC vector charts based on IHO standards. These are the charts of the future for all navigators, and indeed they are the daily charts in use by many professional mariners around the world. The ENC have tremendous facility for providing much more information than possible on a paper chart, but they do not always reach the full potential of information they could. In some cases a charted object actually includes less information than we get from the corresponding traditional printed chart symbol. With the on going active help of mariners using the products, these issues can be resolved. In short, I look at this Hydrographic Notes app idea pioneered by the UKHO as a step toward essentially cloud sourcing the hydrographic information needed to keep the ENC presentations optimized and up to date, and we heartily look forward to its popularity.